What is the Selden Map? A late Ming water color map of East Asia, including China, Korea, Japan, the Philippines, Indonesia, Southeast Asia and part of India, probably executed in the 1620s. The map has no title, and is very large, approximately 1×1.5m. The text is in Chinese, but there are some Latin annotations by a later hand. The map shows shipping routes and compass bearings from the port of Quanzhou across the entire region. A panel of text on the left of the map near Calicut, its western extremity, gives directions of the routes to Aden, Oman, and the Strait of Hormuz. The map has always been known as an interesting curiosity from the time it arrived in the ‘Bodleian’ Library, but its importance was first recognized by the visiting American scholar Robert Bachelor in January 2008. With Beijing's claims to the South China Sea never far from the headlines thanks to the assertiveness of modern China, a recently restored map offers some welcome historical perspective on the oceans in East and South East Asia. Unearthed nearly four years ago in a fragile and discoloured state, the Selden Map of China was bequeathed to England's University of Oxford in 1659 after the death of John Selden, a London lawyer and linguist. It shows sea routes fanning out from Quanzhou in Fujian province in south-east China, a city that attracted a mention in Marco Polo's account of his travels, and which still contains reminders of its Muslim-influenced past. Indeed, while it remains unclear exactly who produced the map, one possibility is that a member of Quanzhou's sinicised community of Islamic merchants was responsible. Such is the interest in the map's origins now, that Timothy Brook, a professor at the University of British Columbia and author of several books about Chinese history, is currently writing a volume titled Who Drew the Selden Map?. "Rather than showing China from within, it sees China from without. In particular, it sees it from the water, which is not the perspective that Chinese themselves have taken when looking at their country," says Brook. China is depicted in terms of its relationship with its neighbours, and the map even stretches to include parts of India. "What this map shows is an interest in the fact that Chinese (and especially Fujianese) people lived in most of the major ports in South East Asia by the early 17th century, from those of Siam, the Malay Peninsula and western Java to Manila and Nagasaki," says Robert Batchelor, an associate professor of history at Georgia Southern University. The document also indicates an interest in the Arabian Peninsula among the Fujianese merchants. One corner has written directions for travelling from Calicut in India to Aden in Yemen, Salalah in Oman and the former kingdom of Ormuz in the Arabian Gulf. This ties in with the possibility that the map may have been produced by a group of Quanzhou-based Islamic merchants. "It also suggests that the ties between Arabia and South China were [neither] superficial, [nor did they] disappear with the arrival of Europeans in the 16th century," according to Batchelor. "That is why this is a map that should be of interest in particular in Iran, the UAE, Oman and Yemen. It speaks of a continuity of global history." Selden himself wrote a book titled Mare Clausum (Closed Seas) that argued against the Dutch view at the time that favoured freedom of the seas and, says Batchelor, the lawyer read the map as indicating a kind of dominion over the areas where trade was taking place. However, the merchants of the early 17th century are unlikely to have seen it as a way of staking claims to, for example, mineral or fishing rights. Instead, Batchelor takes the view it shows their interest in and involvement in the seas depicted. "Rather than a closed China or a globally overpowering China, the Selden Map gives us a window onto the complex and dynamic set of relations that defined East Asian trade in the 17th century," he says. Brook says there is nothing to show Ming China tried to claim territory beyond its borders. The map is one of trade, not empire: "Anyone who tries to use this map to enlarge Chinese claims for a greater empire is engaging in political mischief," he says. Yet, while the map may not have great political significance, even in historical terms, it is of interest to academics, not least because it offers information available from relatively few other sources. Batchelor contrasts this situation with that of the English East India Company and its Dutch equivalent. Their links to their respective governments meant the activities of these organisations were well documented and the evidence preserved for later generations. "By comparison, we know very little about 17th-century Chinese merchants because they were not sponsored by the state. Their private archives and libraries have largely been destroyed over the centuries," he says. It is perhaps especially important that sources such as the Selden Map are understood, given that analysis of certain documents has often resulted in outlandish claims about Chinese explorers. In particular, the author Gavin Menzies suggested in his book 1421: The Year China Discovered the World that the 15th-century Chinese admiral Zheng He discovered the Americas before Christopher Columbus. The claim is based upon an 18th-century map said to be a copy of one from the 15th century. Menzies' views are generally dismissed by academics and Batchelor describes such "dubious" maps as "efforts from later centuries to make up for the lack of a Selden Map". Clumsy preservation efforts meant that, until recently, the map was in a poor state of repair. It was discoloured, the paint on it was cracking and a linen backing from a century ago had turned stiff, cracked, and been patched up. Restoration took about a year, says Robert Minte, a conservator at Oxford's Bodleian Library, who carried out much of the work. Experts at the British Library and the British Museum also took part. "It was in an extremely fragile condition," says Minte. "It had been [lined] with very heavy cotton and rolled up very tightly, so every time the map was unrolled there were fragments coming off. It was very difficult to handle." 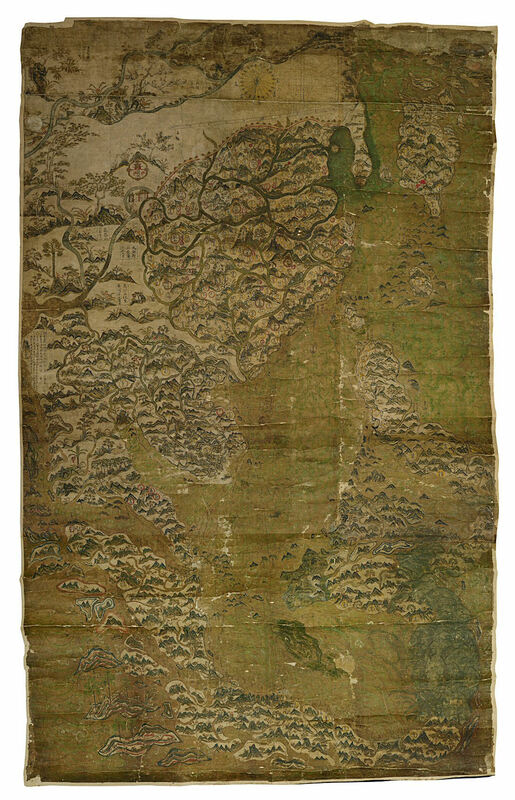 The task was to remove the heavy cotton lining and the various patches while trying not to damage the "extremely thin" Chinese paper on which the map was painted. This work, much of it done with the map face down on a Perspex table, was complicated by the fact that many of the patches were stuck on with a strong glue and the paper to which they were attached was fragile. A bamboo spatula was used to tease away the patches. New pieces of Chinese paper were added to fill in gaps in the original map, and three linings of Japanese paper were attached to strengthen the map, although Minte describes it as "still quite vulnerable". "It can [however] survive far more safely and be displayed much more safely," he says. The painstaking restoration achieved more than helping to preserve the map. It also uncovered many features that would otherwise have been hidden. "Because we spent so many weeks and months looking at the map, we could describe areas of detail through the work we were doing. Some of the most interesting were the details on the back underneath the cotton lining," Minte says. For example, some trading routes are mapped out on the back of the map, in particular the main trade route from Japan to Vietnam, suggesting that whoever produced the map started on one side and then may have decided, for whatever reason, to turn the paper over and have another go. "We're not quite sure whether that's a preliminary drawing or something they started, then made a mistake and changed something," Minte says. Batchelor thinks the drafts also indicate a fundamental difference in the technique of mapmaking, with the routes drawn first, in contrast to western maps based on a grid system. "This suggests different approaches to mapping, navigation and mathematics, which have interesting similarities to our current notions of 'networks'," he says. "Indeed, the map itself shows a system rather than just routes, and this is very early for anyone to be thinking about trade systematically."